Although the Japanese had concluded earlier in 1941 that they would go to war with the United States, they continued diplomatic negotiations through December 7, the date of the attack, with U.﻿S. Secretary of State Cordell Hull and other American officials in order to mask their preparations for the surprise assault. Within an hour after the first bombs had been dropped on Pearl Harbor, but before news of the attack had been received in Washington, Admiral Kichisaburo Nomura, the Japanese Ambassador to the United States, and special envoy Saburo Kurusu delivered a letter to the Secretary of State's office. Minutes after they had left the State Department, the first news of the attack was broadcast. ....Shortly after three o'clock I went to the White House, where I talked with the President and others for forty minutes. Mr. Roosevelt was very solemn in demeanor and conversation. The magnitude of the surprise achieved by the Japanese at Pearl Harbor was already becoming evident. But neither he nor any of us lost faith for a moment in the ability of the United States to cope with the danger. We had a general discussion preparatory to a conference that the President decided to hold that evening with Stimson, Knox, myself, General Marshall, Admiral Stark, and other principal advisers. We discussed in a tentative way the many different steps that would have to be taken, when and by whom. The President early determined to go to Congress with a message asking for a declaration of a state of war with Japan. Over the following hours, reports on the impact of the attack would begin to be received, including news of additional Japanese assaults on the Philipines and Guam. 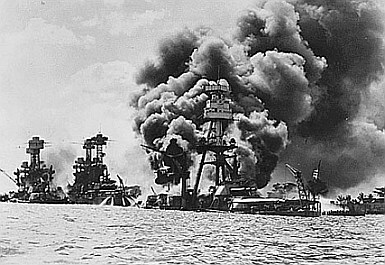 In Hawaii, casualties to U.S. service personnel were 2,343 killed, 960 missing, and 1,272 wounded; additionally, 151 U.S. planes were destroyed on the ground and all eight U.S. battleships at anchor in Pearl Harbor were either sunk or damaged. Only 28 Japanese airplanes were shot down. 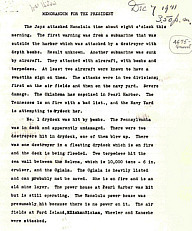 On the following day, President Roosevelt formally requested that the Congress declare war in the famous speech that began: "Yesterday, December 7, 1941 - a date which will live in infamy - the United States of America was suddenly and deliberately attacked by naval and air forces of the Empire of Japan." The attack on Pearl Harbor allowed the President to use the strong public reaction to forge a united effort to mobilize the country for war. Such former isolationist critics as the America First Committee also came on board to back the U.S. entry into the War, with the AFC executive board voting four days after Pearl Harbor to dissolve the organization, announcing that "The time for military action is here." Even prior to the attack on Pearl Harbor, the threat posed by the deteriorating world situation had led to substantial increases in U.S. military spending, with Republicans who had opposed Roosevelt's budget deficits for domestic programs now supporting massive investment in an expanded military. Appropriations for the Army grew from about $500 million in 1939 to over $8 billion in 1940 and $26 billion in 1941. The Naval Expansion Act signed in June 1940 authorized the construction of new battleships, aircraft carriers, destroyers and aircraft. After the Japanese attack, the President announced goals to produce 60,000 airplanes in 1942 and 125,000 more in 1943 and 120,000 tanks over the 1942-43 period. By the summer of 1942, the Army had 1.5 million soldiers, and by the end of the year its numbers had surged to 5.4 million. At the end of the war in 1945, the Army had over eight million officers and troops. 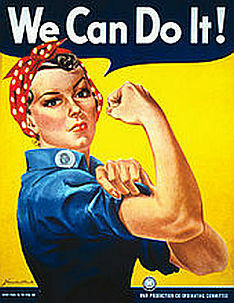 To compensate for the manpower demands of the military, the government encouraged women to enter the workforce to fill both industrial and service jobs supporting the war effort. The public also strongly supported the war through its investment in War Bonds, which in 1942 alone generated $1 billion for military needs and also helped to restrain inflation by diverting excess funds. See Biography of Henry Morgenthau, Jr., U.S. Department of the Treasury. The mobilization for wartime also finally brought an end to the Depression. The Gross National Product doubled from 1940 to 1945, and thousands of new jobs were created to produce the weapons, aircraft and other needs to support the War effort. As available manpower was stretched through the combined demands of the military and the industrial sector, the government encouraged women to enter the workforce to fill both manual and service positions. As in World War I, the first months of the U.S. entry into the war also provoked fears of domestic espionage and concerns over the loyalties of those within the country, primarily directed at Japanese Americans. The opening Japanese successes, including the invasion of two of the Aleutian Islands in Alaska, generated anxiety over a possible attack on the West Coast. In March 1942, the President signed Executive Order No. 9102, creating a civilian agency in the Office for Emergency Management to provide for the removal of persons or classes of people from designated areas considered of military importance, principally on the West Coast. The government rapidly built ten relocation camps which ultimately would house more than 110,000 Japanese Americans. Later, as the fears of a Japanese invasion diminished, some of these internees would be dispersed to other locations for supervised work, including serving as farm laborers in states like New Jersey. In 1944, the internment policy was upheld by the United States Supreme Court in Korematsu v. United States, which would become one of the Court's most highly criticized decisions in its history. Nearly forty years later, the conviction of Fred Korematsu was overturned in a federal court in San Francisco, which found that reports by government agencies disputing conclusions that Japanese Americans posed wartime security risks had been deliberately withheld by federal prosecutors at the time of the earlier judicial proceedings.﻿ In 1998, Korematsu was awarded the Presidential Medal of Freedom, the nation’s highest civilian honor. * World War II Archives >> WWII Archives Foundation, Inc.